Topped with an icing of snow. Is turned into an electric beauty. Yes, my friends, there is beauty in the grey. For more skies, please visit: Skywatch. Posted in History, photographyTagged beauty, copper mines, Norway, Roros, Skywatch, slag heaps, smelting house, snow, UNESCO world heritage site, winterBookmark the permalink. You are more than right about the beauty in grey. Thank you. 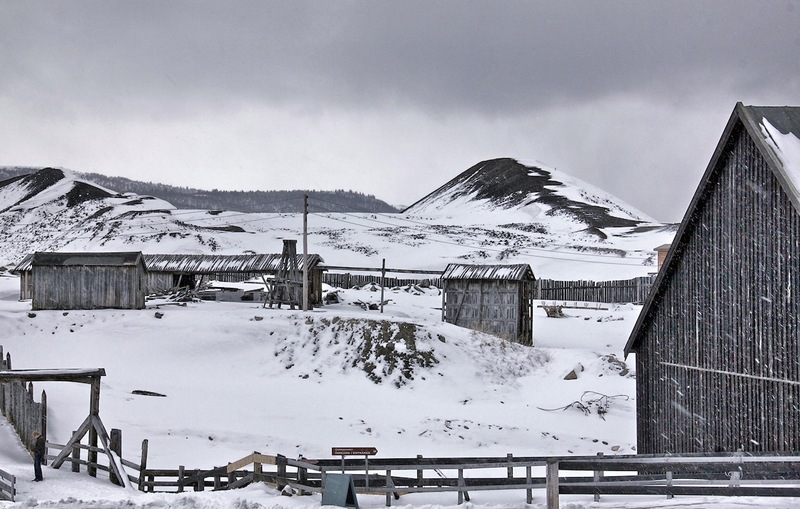 A slag heap all covered with snow, beautiful photos. All the photos are so nice! Juhuuu!! Now I know where you are! =) I have benn there myself, latest last year, a very beautiful place! Oh.. I have forgot to blog about them.. :O I have so many photos, but just a few are blogged.. from time to time.. I guess this is for you and others to.. Yes, it’s the old mining town of Roros… what a fabulous place! Even industrial scenes can have a beauty of their own..
all this snow, does it mean summer will be short, or just delayed? It’s typical April weather I guess… Spring will be along soon. You’re so right that there’s beauty in the gray. They kind of remind me of pics of the west in the mid 1800. Cool. What a great set of pictures – a wonderful change from ‘over saturated chocolate boxes’! I really like them – I miss snow, cold and interesting grey skies! It’s so lovely. It still looks cold. Take care. It’s OK – I don’t live in the mountains of Norway, where it is very cold. I was just there for work. Absalutely beautiful! I really love the grey sky which brings cool showering. Nice shots from norway. There is beauty in the grey! Beautiful photos and words. I love the monochromatic depth to these. Gorgeous grey beauty!!!! Made me shiver though–since it looks so COLD there…. Brrrrrrr…. As much as I love winter and snow, I am really ‘into’ Spring now!!!!! Ready for some warm weather to stick around for awhile!!!!! Yes, actually dressed in beautiful, charming. You’ve shown that there is much beauty to be found in the most unlikely of places if we only take the time to look for it. Thanks for sharing this beauty with us. Wonderful soft grey tones. I like all your photos. They are so beautiful ! Wonderful sequence of snowy shots. I think gray days have a lot of beauty and you captured that so well. Herlig bildeserie fra Røros. Dette er et sted jeg kjenner meget godt! Jeg er enig, – mye flott i det grå! Ha en himmelsk kveld og ei fin helg! nice…it def has a barren feel for the old wood and stone, but also the snow…but you are right in that there is beauty there…. I really love old mining sites in the American west. Your pics remind me of those. The snow is cold and I’m sure you’re ready for spring, but the snow does create a beauty of its own out of some of the most unlikely things! Terrific captures as always. These are beautiful! I like the small amount of color in each one. These look great! I like that some of the colors are secondary to the grey. Looks beautiful and the description was lovely! I especially love the way you composed the first one. Beautiful indeed 🙂 Nicely captured, Lady Fi! I think there is probably more beauty to be found here with the snow than without. Indeed, there is beauty in the gray and the little bit of color that accents each of these gray scenes make for great composition. These stark photos have character. I know gray well. Vi besøkte gruvene der da barna var små, gjett om det var populært. There sure is beauty in the grey! And you found it! Looks very quiet there. These remind me of the American west. I thought at first they were black and white, but then spotted a bit of color. Very nicely done, Fiona. Lady Fi, even with the grey sky your photos are beautiful. Wonderful capture, happy skywatching! You really do see the beauty in everything Fi …. That’s because you look for it ….. A delightful post! En absolutt praktfull serie! Nydelige motiver og flott komponert! Jeg liker virkelig bildene dine! The snow has made these scenes look very interesting indeed. Great shots. I have never been to a location with snow and snow all around. The images talk and say I should visit location where there is snow. I love snow, as you can tell from my blog. Lovely shots! Brrrr! I truly believe you can find beauty in anything! Interesting how snow turned a negative landscape image into a positive photograph. Lovely scenes and sky you have showed us today. I can feel the crispness that must be in the air as I look down at that cold running water. You indeed captured the beauty in the grey. Oh yes, these are stunning photos! Nice photos! I enjoyed them very much. beautiful indeed: well done. I like it! Flotte bilder! Jeg vet hvorfor jeg elsker Norge! Ha en god weekend! Ohhh…thank you for your prompt visit! You are an early person like me… I like to start the day early in the morning! What a great eye you have, yes, these are starkly beautiful scenes indeed. Grey makes the mine look kinda bleak. What lovely photos! The scene is very charming and your description gave me the feeling that I was there! Great grey shots! And, the short descriptions enhance the beauty. There sure is beauty in Grey and White, and you’ve shown it. Boom & Gary of the Vermilon River, Canada. Grey is beautiful, and what great captures. Honnestly I prefer blue skies and no snow, lol ! Very beautiful monochromatic landscape like Indian Ink paintings. Certainly beautiful and a definite contrast to the lovely spring weather we are having in Toronto today. The beauty of cold. Awesome shots! really beautiful ~ really like the touch of red on the buildings among all the grey. Your painterly photos have me missing the snow! Hey, I’m so glad you said there’s beauty in the gray–as I have some! 😛 Lovely photos! It’s indeed a very beautiful site,love the brick tower. You always amaze me with your ability to find beauty in whatever you see. The snow not only covers up a multitude of “sins” but also creates its own unique beauty out of them. Beautiful series, love the B&W in these pictures. i wish i could catch a sky as dramatic as this someday. · Beautiful photos. I love snowy landscapes. And today we have snow in S. Ontario! Respect wildlife! Your day will not be gray now that you’re happily Freshly Pressed! Oooo – thanks for letting me know! How exciting! Love the stark beauty of your photos! . . . Congratulations on being “Freshly Pressed”!! Incredible photos! Isn’t it brilliant how your mind sets your eyes out to grab hold of any color available. Your quest to find color has turned into a blog full of great beauty. Thank you for sharing with us all. Thank you for tis brilliant post! Upon reviewing the photos I took in Whistler Canada – a friend asked whether they were in black and white. They were not; it was natures beautiful grey pallet. i love grey snowy days – it’s surprising how evocative just a few muted colours can be, and your photos capture that beautifully! Congrat LF on being pressed! Wonderful shots! Wow, that first photo reminds me so much of where I’m from (the Palouse) even though it’s nowhere close, haha. Very nice shots! Thanks for sharing Norway with us. Those pictures are breath-taking, Norway s on my list of places to visit. picturescue and serene photography of true nature..great indeed.. I love the comfort of a dreary day. It is the one time that I can actually find myself slow down. 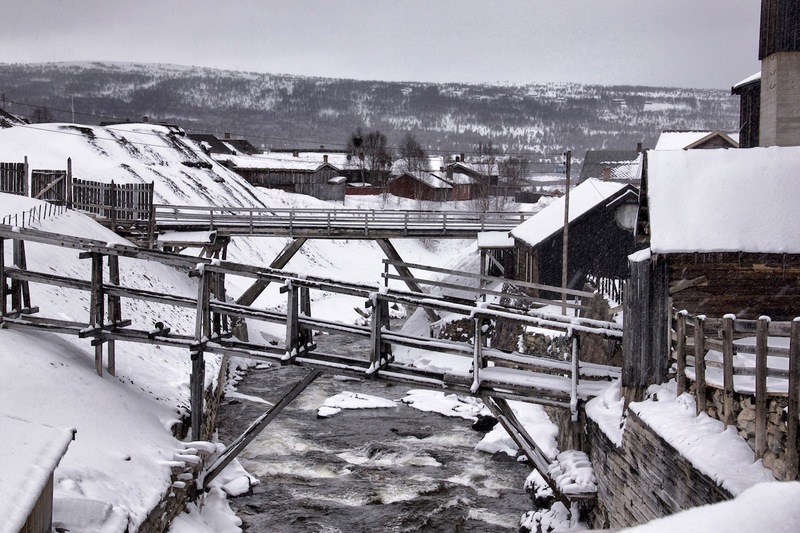 Røros is so beautiful, isn’t it? I went there myself last year and it was just gorgeous. I wish I was better at taking photos, though. I’d say pewter rather than grey. Wonderful! Love it and miss it! Love the use of color here. Very nice! I love the gray scales. great job! Gray is my favorite color, so you can understand how much I find interesting your pictures, they offer a really charming atmosphere! Your words are just so beautiful! As well as your photos — stunning. I’ll grant you poetic licence to be romantic about the blanketing snow’s beautification of the slag heaps. But doesn’t it make you cry that they were left, just like that – raw and ugly and foreign to that pristine place? Though, I grant you, the log cabins of the workers are indeed beautiful, in their way. Nevertheless, congratulations. Well done. nice photos..it would be a great place to be alone and gather yourself once in a while..
shooting in flat / gray light and coming up with great shots is hard to do. Great Job! Thanks. They were actually taken in colour, but the weather was so grey that it created this effect. Looks amazing. I love the way snow and ice transforms a landscape. What a beautiful poetic post! I loved how you showed us a different side of grey. :) Would love to visit this place one of those days. Amazing. Great photos. I love snow so much. 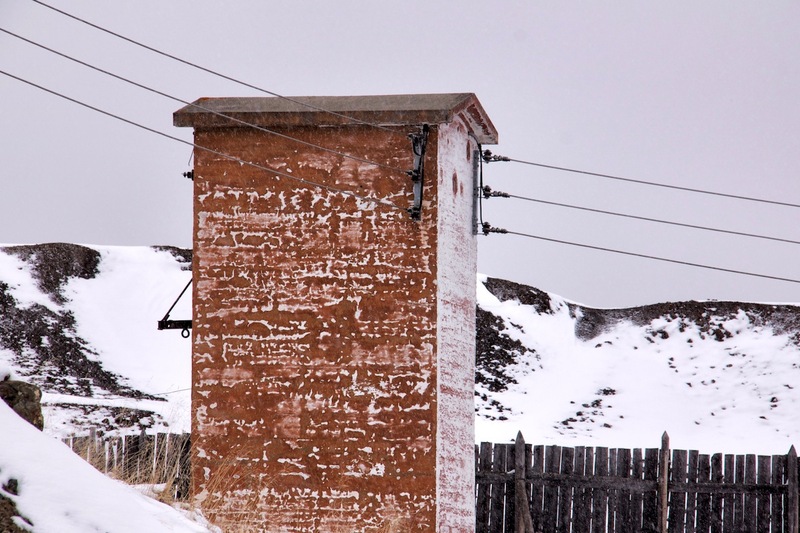 This is so beautiful – and it’s an old mining town? How interesting! As a photographer shooting an area not many people have shot makes everything more magical! Japan is so amazing – the colors, the culture, the characters; simply amazing. Congratulations on being featured on Freshly Pressed Fiona! Lovely photos – especially the first one. Indeed there is beautify in the grey! Wow, I really thought those were black and white photos until I scrolled down to the third one! Then I went back and noticed the tiny slips of color. Nice! Simplistic color palettes can be very striking, especially from a great perspective such as yours. Congrats fellow freshly pressed alumni! Absolutely lovely. Congratulations on being Freshly Pressed! Such a desolate but beautiful landscape! Thanks for the pictures. Utrolig flotte bilder …. liker fargetonene. Det er Røros, er det ikke? Yes – this is Roros a couple of weeks ago. I like very much the aesthetics of the cold. Oh my! You are such an artist with a camera. So beautiful! Thank you for sharing!!!! Beautiful, atmospheric & poetic. I love barren, wild landscapes too. Wonderful. Some people tell me that seeing a winter landscape makes them depressed because they think of everything being dead. I, however, agree more with you. I find the grey and white beautiful. For some reason, it actually is something that fills me with hope when I see it. The second image is my favorite of the three. I hope to see more of your beautiful pictures. At first I thought this was about the Fifty Shades of Grey book series. Guess I was mistaken, but the photos are haunting none the less. I have been a black and white photographer for years. Color always seems so garish in comparison to the subtleties and textures found in the pure white through grey to pure black spectrum. There is nuance in the bi-chromatic spectrum which one can only find by studying its extremes and contemplating them through the grey transition zones. This is very much the heart of the Tao, which understands and holds the polarities, yet finds itself truly manifest within the relationship of transition between the two. And, yes, well, having lived in Europe, I find europeans much more able to enter into those grey zones. Lovely work. I did a similar series in an old, brick, broken-down, rubble heap of one of the many abandoned paper mills that dot the landscape here in New England america. Thanks, really enjoyed the perspective and tonality. I could study the subtleties in these photographs for hours. Which, I know, is exactly how they were made. My life has felt quite gray lately… this is beautiful. Can I print one, frame it and put it on my bookcase? Grey can be beautiful. Please feel free to print a photo. It seems a very melancholic place. of the play of life. Thank you for making me feel better about my wardrobe… Which is chock full of grey, black and white clothing! Stunning photos… I think I would freeze there though! Nice. I’m assuming it’s an abandoned mine…..great pics. would love to know what kind of camera you are using! I use a DSLR Canon 500D with a zoom lens. Thank you for sharing your beautiful photos…you captured it all perfectly. Yes, Roros is also one of my favourite places in Norway. I stayed there in a hotel with a Norwegian cousin. I also dedicated several of my posts to this wonderful little mining town. Very nice. Just like everyone else, I like a nice summer day but you just can´t beat beautiful winter landscapes. These pictures are really stunning! This is close to what my world looks like right now… 🙂 You found beauty in the dreary. This post was Freshly Pressed by WordPress – i.e. picked as one of their top favourites – hence the crazy number of visitors!